In my experience, society is fixated on the medical model, the ‘what’s wrong’ approach. Whilst the medical model is clearly a valuable and required tool, it often leads to labels that individuals are then lumbered with, such as, ‘she has dementia’, ‘she is visually impaired’, ‘he’s deaf’ or has a ‘leaning disability’. Taking this approach overlooks the person behind the ‘condition’ and so can restrict inclusion. 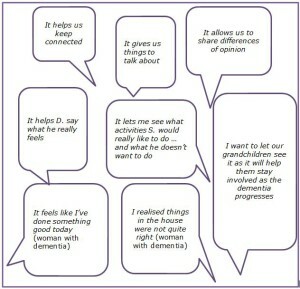 One example could be an individual with dementia being unable to make everyday choices about seemingly mundane issues such as what to wear that day. Using a medical model, a carer may be aware of the clients difficulties and make choices for them, whereas using the social model approach enables the carer to see beyond the condition and fully include the client, allowing them to be part of the decision making process for themselves. 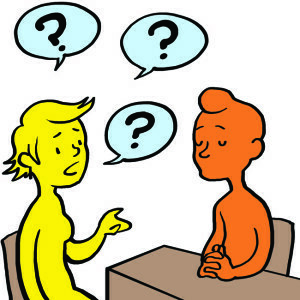 A second example could be a person with a communication disorder such as Asperger’s Syndrome. Access to work could be severely restricted using a medical model as the pragmatic manifestation of this condition may well exclude a person from seeking certain types of employment. Promoting the use of a social model would ensure work colleagues understood the possible limitations of the condition and ensure adequate support networks were in place. The social model attempts to embrace a person’s difference and raises awareness within society of individual needs that will facilitate inclusion into all aspects of life. 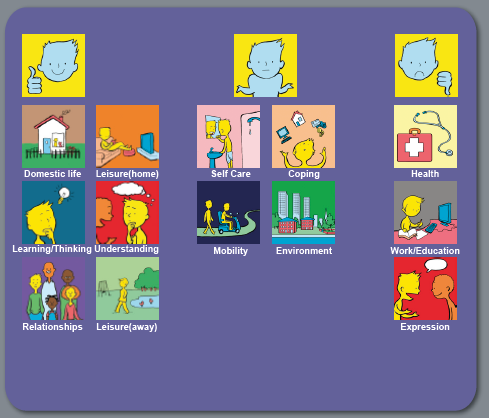 The Talking Mats Health and Well- being resource is based on the WHO ICF and supports a person to reflect and express their view on various aspects of their lives. Using the Health and Well being resource supports workers to remember the person behind the condition. 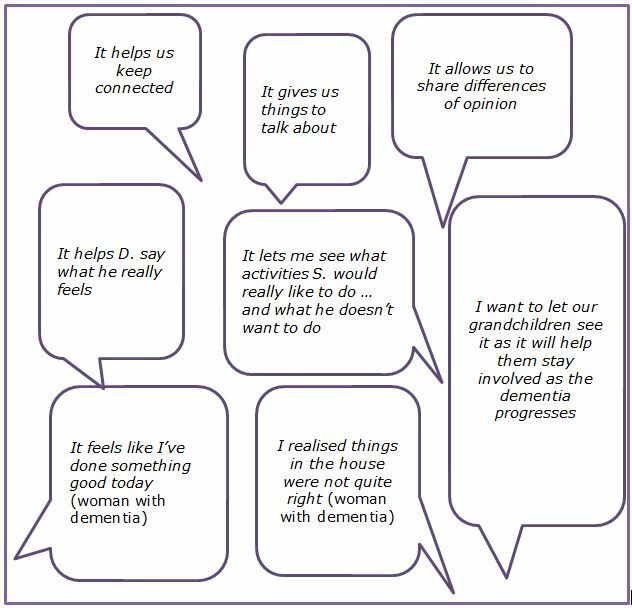 This entry was posted in Blog, Dementia, ICF, Learning disability, Participation, Personalisation, Self directed care and tagged Dementia, Learning Disability, Participation, Personalisation, Self directed care on June 10, 2016 by Rhona Matthews. This tool will be useful in helping some residents make decisions, informed choices and express their needs. It will take time for some residents to feel confident in using this tool. 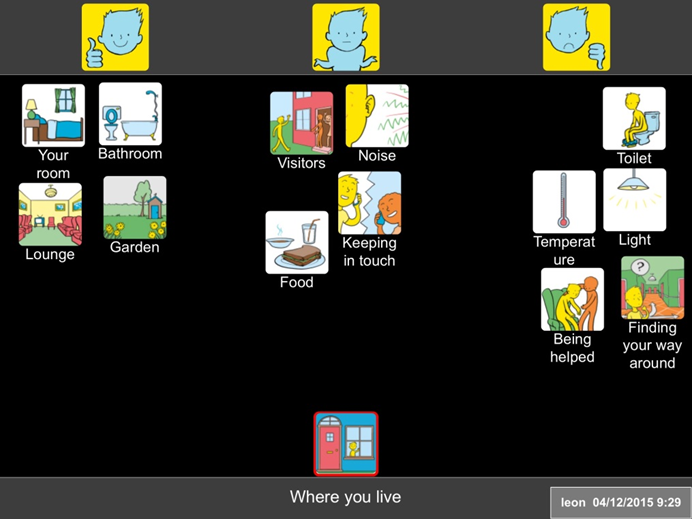 I’d like to use it with some residents to be able to adapt Talking Mats more to their understanding. I’d like to use this tool for resident’s reviews to find out what the residents likes/dislikes are. Talking Mats will be great for service evaluation. Talking Mats will be great for asking residents about things they want to do. Updating Care Plans regularly from outcomes of Talking Mats. It can be used to get to know people’s needs and wishes more. Share the findings with colleagues and joint services. Hopefully through its use I’ll learn to pass it onto others. A gardening set. Service evaluation and well-being assessing stress levels/anxiety/emotional state? I’d use it to promote choices of activities. Care Inspectorate forms. Finding out how people enjoy time at the service and how to improve on it. Can you let us know how you use Talking Mats as part of your work? This entry was posted in AAC, Blog, Communication difficulties, Learning disability, Participation, Self directed care, Self management, Training and tagged AAC, Communication difficulties, Learning Disability, Participation, Self directed care, Talking Mats, Training on September 18, 2015 by Joan Murphy.